The Key System Mole and Ferry Terminal (1903-1936) was, in pre-Bay Bridge days, one of several earthen piers extending from Oakland far out into the Bay, to facilitate passenger train/ferry connections. Piers built on wooden pilings (like Berkeley’s) could support light vehicles, but the extra weight of railed transport required a solid foundation (cf. 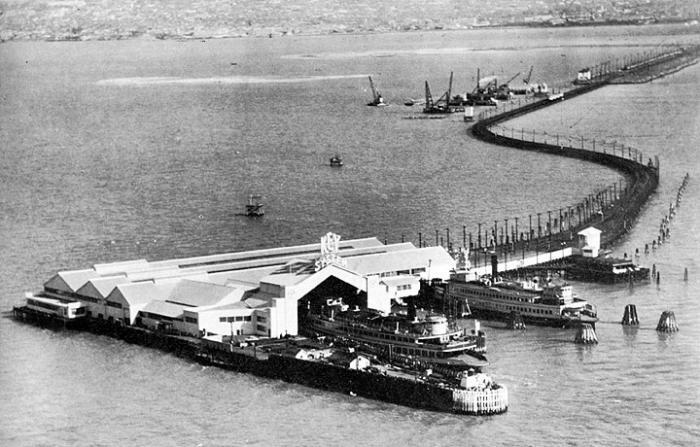 the Oakland Long Wharf or Alameda Mole). Today, the a portion of the Oakland side of the Bay Bridge is built atop—and almost parallels the original route of—the Key System Mole’s landfill 1. At its terminus about ⅔ of the way to Yerba Buena Island, the Mole widened into a huge ferry terminal, built on wooden trestles, which included several ferry moorings; out-of-service streetcar storage; passenger waiting rooms; concessions, etc. Thankfully for the Key System, one ferry slip and the trestle itself escaped damage, as did three ferry boats and approximately 60 cars. Three days after the fire, the Key System resumed operations on the Mole for some of its lines, with the others requiring passengers to transfer to the Southern Pacific's lines. At some point thereafter, a portion of the trestle was rerouted to allow the construction of the Bay Bridge, where System streetcars then ran (on the lower deck) for 20 years. The re-routing of the trestle can be seen by comparing later pix of the Mole with the route shown on the older maps (where it runs straight from beginning to end as on the map above). We are still searching for more information on when and how the reconstruction occurred.